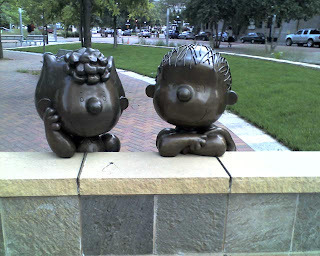 I visited St. Paul for the first time this week on a business trip. I didn't have a rental car, so I didn't get to tour the wider area, unfortunately. Still, as this was August (not January), this Southern boy liked what he saw. 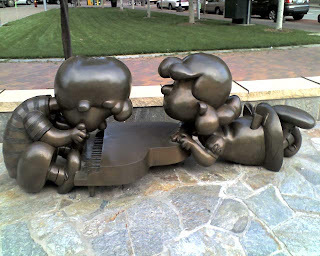 Secondly, from my limited exposure, it's a city that appreciates the arts. I was rather surprised in my own company's building where each major hallway is lined with artwork varying from local school children (not pre-K, but talented ones) to artists long passed. Sizes varied from the small to very large, rating a "Very cool." I tried to take a picture of some in a hallway with my cellphone camera, but it didn't work out. Fortunately, the cell phone did better with the pictures below. 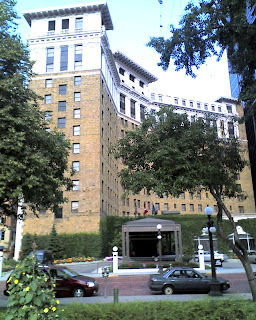 I stayed at the St. Paul Hotel, a registered "historic" building that has been modernized. The room was nice enough (I'm not that picky), the lobby was fairly ornate, and the service staff were very well appointed, including a greeter with a top hat. It's not your everyday Holiday Inn, but at $110, it's cheaper than the other hotels in the downtown area. 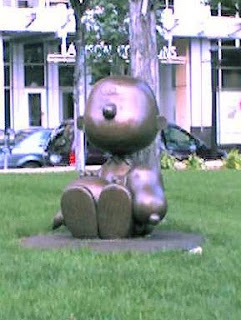 Adjacent to the hotel was Rice Park, a small grassy area (did I mention clean?) with benches and a fountain. 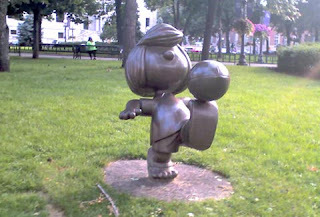 Bronze statues of Peanuts characters were placed around the park. 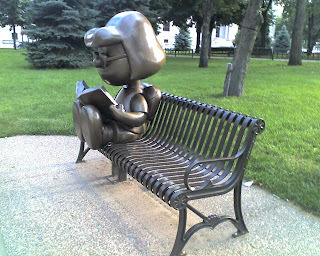 One internet search away, and I discover that Charles Schultz grew up in St. Paul. There you go. 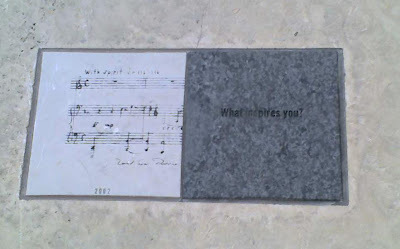 Inscription reads: "What inspires you?" 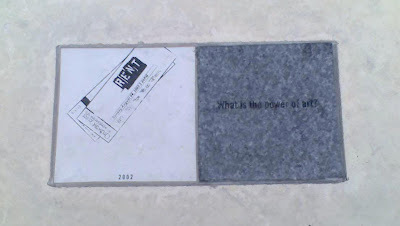 "What is the Power of Art?" Thirdly, it has some charm to it as well. As the hotel dining offerings were above my credit limit, a friend and I ventured out to find a meal. 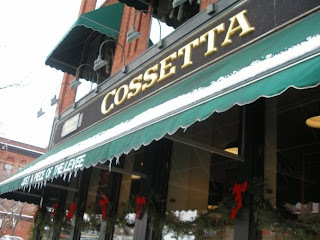 A few blocks away was Cossetta's Italian Market and Pizzeria. 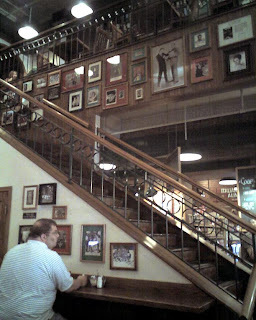 On the sidewalk, the voice of Sinatra greeted us singing "My Way," and there was a signed portrait and card of The Chairman on the wall as we walked in. Add the Italian aroma, and count me in! We walked in to find a line about 20 people deep for a buffet style meal. I'm generally not too keen on buffets (the food has been there for how long, exactly? 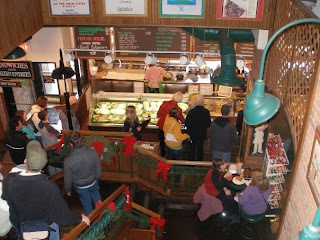 ), but this one was at least attended by staff who scooped whatever you requested onto a plate. I ordered the Chicken Marsala, which emerged from a sea of thick dark sauce... tasty, and surprisingly spicy. This was served with a small hard loaf of bread and, being no expert, some kind of pasta with tomato stuff on it. We ventured upstairs to find a seat, as most seemed to do. It's apparently a very popular restaurant, and family friendly. The meal was well accompanied by a decent local beer, Summit EPA. As might be imagined, the place is "et up with atmosphere." On the walk back to the hotel, we looked over a railing near the Science Museum (that was advertising a Star Wars in Science exhibit - more on sci-fi next week...). The view speaks for itself, complete with a moving train at the lower right. 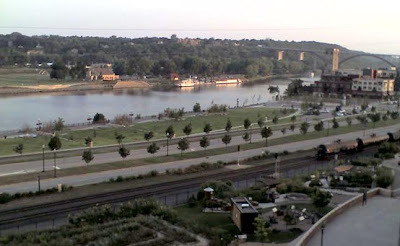 That's the mighty Mississippi River, the northern end of which I had never bothered to locate (it begins in Lake Itasca, MN). All in all, it was a great trip, but a visit to a local CD store would have topped it off nicely.